Yay! Today it’s Friendship Day. It’s one of Dora’s favourite days! On Friendship Day, friends all around the world have parties and wear special friendship bracelets that show they’ll be friends forever and ever. But oh no! 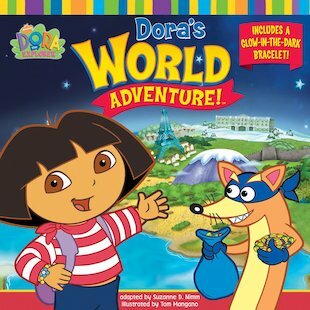 Naughty Swiper has swiped the friendship bracelets, and it’s up to Dora the Explorer to get them back! Join her as she goes globetrotting all around the world, from France to China, Tanzania to Russia, to find the missing bracelets. Will Dora manage to save Friendship Day… and will she have a bracelet just for YOU?